Enjoy the brief dry spell. After a series of storms over the last week, there should be a 24-hour dry spell in most of the Bay Area. Temperatures on Monday should hit the 60s and there is no precipitation in the immediate forecast. There should be clear conditions and light winds. The nice weather should continue until early Tuesday, when rain is expected again. Rains should hit by 5 a.m. Tuesday in the North Bay. And by Wednesday, the rest of the Bay Area should be wet again. Showers are likely to hit before 4 p.m. The short respite from rain comes after a series of storms, which slammed the Bay Area - the heaviest hit on Sunday and brought an additional two to seven inches of rain to some areas. The North Bay saw 10 inches of rain in the last five days. 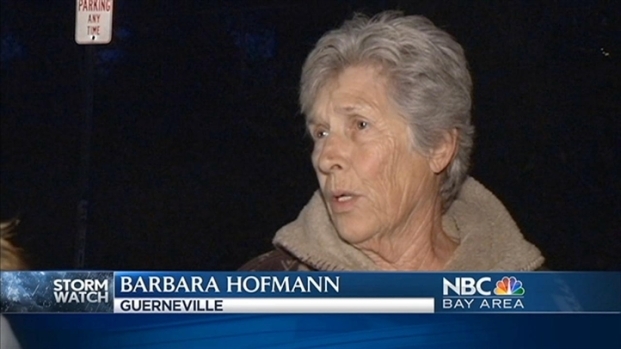 It was a very scary day for people living near the Russian River in Guerneville. Stephanie Chuang reports. There were also some major wind gusts on Sunday, including one that clocked at 80 mph in the hills of Los Gatos. The rain turned streets in downtown St. Helena into rivers before sunrise over the weekend. Shop owners in St. Helena were worried whether they would be able to open, but things cleared out and the water receded in time for a fairly normal Sunday. Rain was also blamed for dozens of traffic accidents. One accident shut down the Richmond San Rafael Bridge. A second crash left one driver dead when her car crashed into an SUV that was parked along northbound 280 in Daly City. The rain also caused 125,000 PG&E customers not to have power, and a power outage at BART headquarters that shut down the entire system for about an hour. Get live weather radar at this link.